I finally finished my "IAP" toe up socks that I started in January. The yarn is Lion Brand Magic Stripes, color: Denim (I think). Katie gave me this yarn and another color of the same kind for my 30th birthday over a year ago. I think it's 75% wool, 25% nylon. They fit pretty well, but are a little tight in the cuff. I knit them rather long so as not to have any leftover yarn but didn't think to increase as I went up the cuff. So, I can't pull them up all the way. 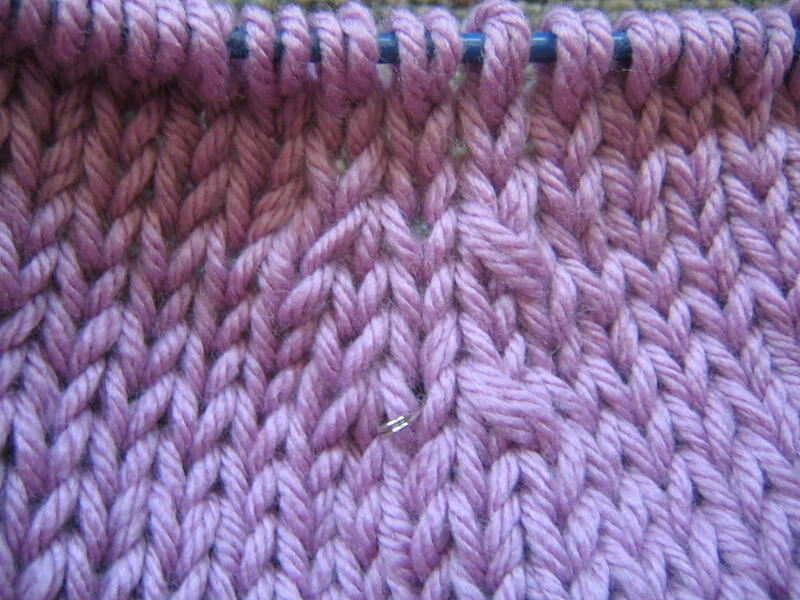 I did that complicated bind off with the needle because it's a lot more stretchy than a traditional bind off. As usual, I finished these warm woolen socks just in time for 90 degree July heat! So... Anyone know of any cute baby boy patterns? hey gals, check it out! the charlotte sweater [from a season's tale] is sewn and stylin'. i'm psyched because it's my first full sweater -- not a shrug, not a bikini top, not a tubetop. a little rough-hewn at parts, but i guess i can pull off the deconstructed look. :) this picture is the sweater pre-blocking; i'll let you know how it comes out when it's done its shaping thing. in any case, i should really go to bed. night night! I finished my first 3-dimensional project! This teddy bear is going to my nephew in Chicago, but I think it's so cute that I am going to eventually make another one for myself (ahem.. for my baby, I mean). It's croched in Lion Brand Wool Ease with a Dover wool knitted i-chord bow.